After spending most of Tuesday in the red, a recovery in the final hour of trade pushed the S&P500 most of the way back to break even. 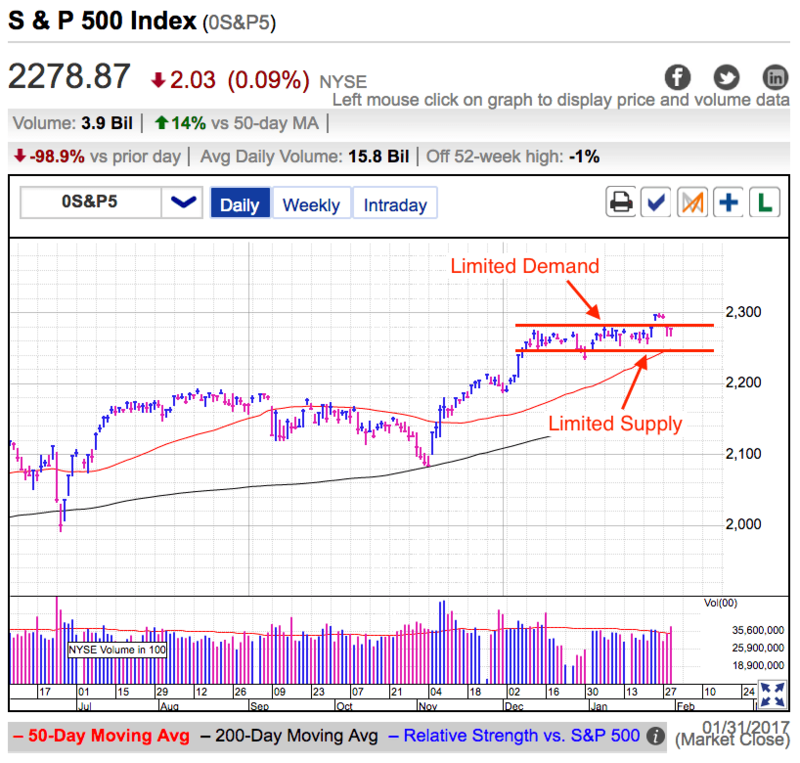 Monday’s weakness killed last week’s breakout and pushed us back into December’s trading range, but Tuesday’s resilience tells us most owners are not abandoning their stocks yet. 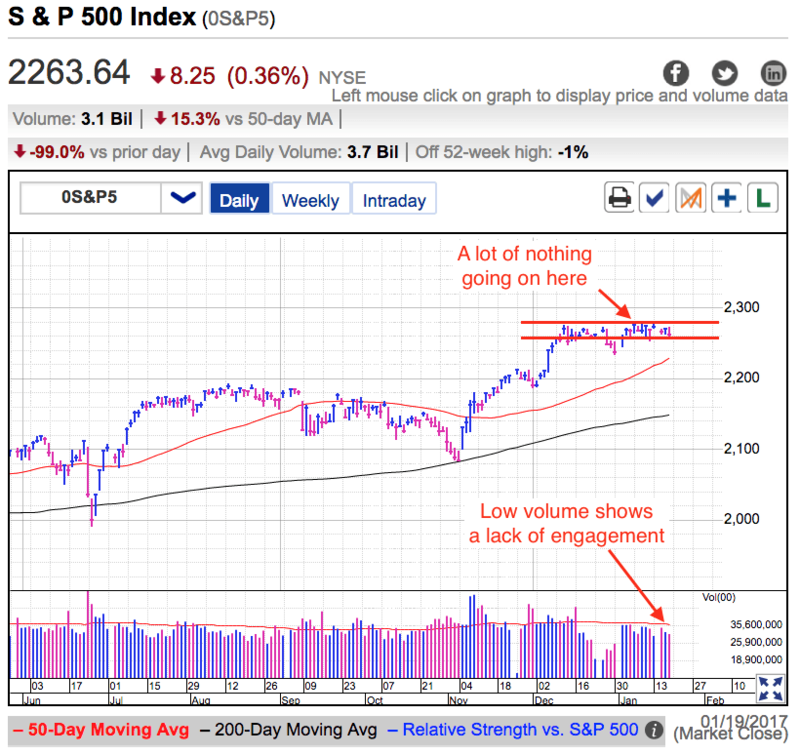 Volume was the highest of the year, no doubt boosted in large part by end-of-month adjustments. The headline of the week has been Trump’s executive order to stop admitting immigrants from seven Middle East nations. As far as corporate earnings go, the financial impact is negligible but that that hasn’t stopped traders from selling the news. In large part they are not reacting to this story, but being reminded Trump’s unorthodox leadership style cuts both ways. Stocks enjoyed a strong close to 2016 on hopes of reduced regulation, tax cuts, and corporate tax reform. Largely forgotten in the cheer has been Trump’s less business friendly stances. Trump’s moves over the weekend reminded traders that his presidency won’t be all sugar and cream. Demand near record highs has been an issue since early December and it is not a surprise to see stocks retreat from last week’s breakout. While confident owners continue holding for higher prices, few with cash are willing to chase the market to record levels. This standoff between bulls and bears has kept us rangebound for nearly two-months and at this point it doesn’t look like that is changing anytime soon. As long as we struggle to find new buyers at the upper end of the range and owners refuse to sell the lower end, we are not going anywhere fast. At this point I’m more cautious than optimistic. The 200-point rebound from November’s lows priced in a lot of good news our leaders and the economy need to deliver. Hit these targets and the market will yawn because it already priced in most of those gains. But run into a snag and we tumble into all the clear air underneath us. Momentum is higher and all else being equal, we should expect the slow drift to continue. But the reward from owning a slow drift is small, especially when compared to the risk if something unexpected sends a chill through the market. Small gains and large risks create a poor risk/reward. That said, it is a tad too early to short this market because we will continue creeping higher until we have a reason to tumble. This is not a bad place to take profits, but wait for that worrying headline before attempting a short. Only options sellers and nimble day-traders make money in flat markets, the rest of us are not getting paid to own risk and are best served waiting for a better trade. The S&P500 did a lot of nothing Thursday, continuing 2017’s trend of doing absolutely nothing. We’ve been sandwiched between 2,260 support and 2,280 resistance since the year started because traders are stubbornly sticking to their positions. Price move when people change their mind and right now bulls are staying bullish and bears are staying bearish. Headlines and economic data no longer matter when people stop trading them. Trump will become the 45th president of the United States Friday. Love him or hate him, it will be nice to put all of this behind us next week. Clearly the Trump trade is struggling to find new buyers since we stopped rallying in early December. Maybe we are simply consolidating gains before the next leg higher, or maybe we exhausted the supply of new buyers. Given how sanguine the market feels, it is hard to claim there is a lot of upside left because everyone is too pessimistic. If anything, I’d say traders are too optimistic and that leaves us vulnerable to a reversal in sentiment. Even though the market barely moved 1% since early December, you’d hardly know it given all the arguing going on in the Twitter and StockTwits streams. Flat stretches like this chew up opinionated, over-active traders who jump on every “breakout” and bailout of every “breakdown”. Buying high and selling low rarely work out, but traders who come to the market with a bias on their sleeve are helpless victims to the market’s countless head-fakes. Directional traders make a lot of money when the market is moving, but they get eaten alive during these flat stretches. Sometimes the best trade is to not trade. That simple piece of advice could have saved a lot of people a lot of money and heartache. What is the market going to do next? I wish I knew the answer. But the great thing is we don’t need to know because the market is going to tell us. The longer we hang out near resistance, the more likely it is we will eventually poke our head above it. We’ve encountered numerous negative headlines and bearish price-action. If this market was fragile and vulnerable to breaking down, those would have been more than enough to kick off a wave of selling. Instead supply dries up and we rebound within hours. That bodes well for a continuation. But demand continues to be a real problem for this market, so any gains will be slow. At this point, a continuation is more likely than a correction. That said, if something comes along and actually spooks this market, there is a lot of air underneath us. 2,200 support is an easy jump from here and it wouldn’t take much to break through that and test the 200dma. High probability of a small gain, or a smaller probability of a large loss. Which way you trade this depends on your risk appetite, but no matter what, be ready to jump out of the way if hints of fear start cropping up. A dip under 2,260 driven by a new and unexpected headline that doesn’t bounce within hours is our sign that the market is starting a pullback to support. Trade accordingly.